You are in Home » Foodie Fashion » Shop Foodie Fashion at Adriana’s Best Recipes! 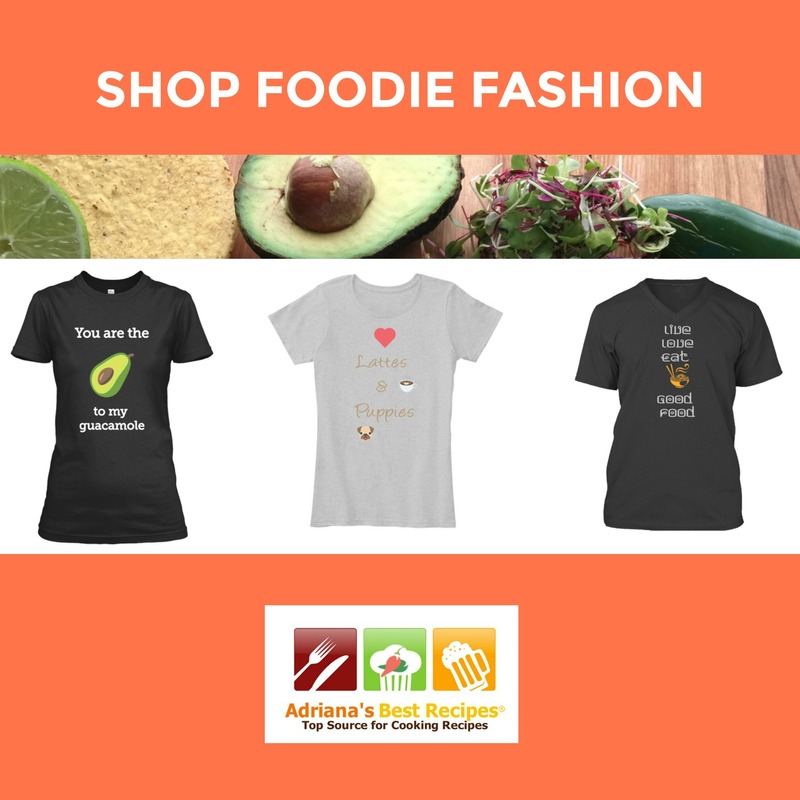 Now you can shop for foodie fashion here at Adriana’s Best Recipes. We love custom-made tees and accessories that have a food theme and thought would be wonderful to open our own online store to share some of our creations with all our followers and foodie friends. That is why today we are launching our Foodie Fashion online shop. You can find a variety of collections designed with the foodie in mind. Same and many of our readers we are not only taco experts but avocado lovers and connoisseurs. Meet our “Avocado Lover” collection because why not confess “You are the Avocado to my Guacamole“. For the salsa and chips fans, we created our “Let’s Salsa and Chips Together” perfect to dance around and pair with some margaritas plus fiesta time. This is a fun design that comes in various cheerful colors. We latinos like spice and color in our lives so we tried to bring that flair to this new tees. Many of you know I love my dog Bella and drinking coffee. I can imagine there are few of you that share that same love for lattes and fury BFFs. This collection called “Love Lattes and Puppies” is for all the ladies that enjoy special time with their doggie BFFs and adore good coffee, pugs and pink. This collection includes a tote to bring along in those long park walks to carry all the doggie essentials. And for the quintessential foodie and chef at heart we dedicate the collection “Live Love Eat”. Because all of us that are passionate about what we eat we want to enjoy only good food. And when traveling we also want to be comfy so this tees and sweatshirt are perfect when embarking on all those foodie adventures visiting special spots and restaurants. I am a romantic, must confess so for those that enjoy life and live to the fullest why not considering buying a statement tee that celebrates life. Enjoy the “Life is a Feast” collection. With a romantic look and fun pink options among other nice colors for all the ladies that enjoy La Vie en Rose and good rosé wine. Hoping you love our new foodie fashion products and order soon. We do appreciate and value your patronage. These are super cute!! I love all the food related puns and references! The let’s salsa and chips is probably my favourite! These tees are so fun and clever! I love the lattes and puppies shirt : ) These shirts make great gifts too. Thanks for sharing! These are the cutest tops! I need that “latte and puppies” one! Two of my favorite things lol! These are so cute! I love this idea! I really like the Love Lattes and Puppies one! I’m fairly obsessed with all things avocado. Thankfully I have a pretty good tree to keep me supplied. That guac shirt needs to be mine! I love all of these, and I think I have idea what I am getting my boyfriend for his birthday. He loves cooking so he will love a T-shirt like this . That avocado t-shirt is too cute! I love avocado so this shirt is absolutely perfect for me. These are great! I see a few that would be prefect gift ideas for family and friends. These are definitely cute foodie shirts that you have here. Although the avocado to my guac always sounded strange to me because it meant being crushed and mixed with a bunch of other ingredients. Although it is essential because you cannot have one without the other. I love the Life is a Feast one! A warm hoodie would be perfect for winter – with all the holiday feasts of the season. I don’t often see foodie clothing. The avocado design would make a nice gift from one avocado lover to another. These are awesome! I love food therefore I love these foodie tees. So fun!